PSI offers a family of microwave photonic links operating to over 40 GHz. Standard products includes links employing direct or external modulation and offer wide dynamic range and excellent noise figure performance. The PSI 1600 series microwave photonic link permits transmission up to 12 GHz analog signals with high dynamic range typically better than 112 dB in 1 Hz. 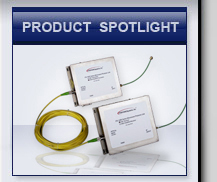 Links are offered in various levels of bandwidth, noise figure and dynamic range performance based on application needs. 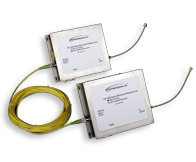 Our PSI-2600 series microwave photonic link offers very high dynamic range through use of lithium niobate (LiNbO3) Mach-Zehnder modulators. The PSI-3600 series offers unmatched photonic link performance; intrinsic links with RF gain and record-setting low noise figure at microwave frequencies.